Wedding planning & design for couples looking for a day they will want to relive over and over again. 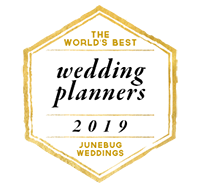 Named on Junebug Weddings 2019 top wedding planners list. Milestone moments in life don’t come around that often, so why not celebrate them by creating lasting memories to hold on to. I offer a wide range of services to help create the wedding or event of your dreams. read more. There is something so exciting about receiving a stand alone invitation in your mailbox. But a lot of people feel as if custom stationery just isn’t worth the investment. I’m here to change the way people look at custom invitations. read more. It's so nice to virtually meet you. I’m Shannon. Lover of design + organization. I am a wedding planner and designer, stationery designer, and social media consultant in Barrie, Ontario. I can’t function properly without a strong cup-of-joe in the mornings. I’m always chasing a sunset. I recently married the love of my life. Oh, and I am a proud dog momma to the cutest little fur ball. “Shannon really nailed it out of the park. She perfectly encapsulated everything I envisioned. She was absolutely amazing to work with! "Shannon’s role was critical to the perfection that was our wedding day. Throughout the planning phase, people would tell us that our wedding day would be stressful, but we truly felt we were able to enjoy every minute knowing Shannon was running the show! Shannon was able to keep everyone calm, relaxed and worry free, which allowed us to enjoy our day – it is exactly what we needed. Also, her creativity gave us a beautiful interactive piece that got our guests talking. We cannot thank Shannon enough for all that she did for us, it was truly a fantastic start to the rest of our lives." "When it came to my wedding I was feeling a little lost...I had attended 9 weddings in 2018 and at some point they all start to blend together. I began to realize that paper was one way I could differentiate our day and create a cohesive brand and set of imagery that would get carried throughout- from invites through to day of design. This is the point when I reached out to Shannon. She is SO talented at what she does and if you don't hire her, you're crazy! Shannon designed my wedding invitation suite and I really could not be happier. After an initial phone meeting, telling her all about me and my fiancé and about our wedding day, she put together the most beautiful paper suite. Not only is the design perfect, but the quality of her products are also amazing. It captured both our personalities and wedding day so perfectly and created that sense of cohesiveness that I was looking for. “Shannon has an incredible range when it comes to design. She will bring your ideas to life at their full potential! I’ve worked with Shannon for several projects (events and custom stationery designs) and have full confidence in her. Shannon is lovely to work with and I 100% recommend hiring her." Founder of #TheSocialProject - a platform for creative entrepreneurs to collaborate, challenge, and inspire one another. Featuring monthly podcast episodes with some of the top creative entrepreneurs in our area.